Errinorne Isle is named after House Errinorne, who has ruled over Skywatch since the Late-Merethic Era. In the center of the island lies the Errinorne Academy, whose purpose is entirely unknown. 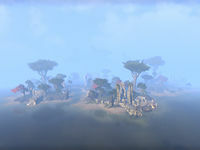 Errinorne Isle has always been a part of the Buraniim Sea-Complex since the time of the Ancients, but it would eventually become a shipping and warehouse complex for Skywatch. When the Sack of Skywatch occurred in 1E 1301, the Sload of Thras took over Errinorne Isle, ransacking the High Elves on the island. The Errinorne Academy was destroyed by the Sload. The Sload had held control over Errinorne for many years following the Sack of Skywatch. Their control over the island ended in 1E 2260, when the All-Flags Navy had obliterated the Sload and made their way to the Thrassian Archipelago. Errinorne Isle was abandoned ever since. In 2E 582, Errinorne Isle was occupied by the Veiled Heritance, a radical group of High Elves that were strongly opposed to the First Aldmeri Dominion. The ruined academy would become the Veiled Keep, the Heritance headquarters. The island would become their training grounds for new recruits. At the same time, an Agent of the Dominion infiltrated Errinorne Isle, going through the trials for recruits in the effort of entering the Veiled Keep and gaining intel on the group. It was revealed that High Kinlady Estre of Skywatch was the leader of the Heritance, and so the Agent was able to swiftly defeat the leaders of the Heritance. All the while, Estre escaped Skywatch and begun her battle against the Dominion on Auridon. With the fall of the Veiled Heritance, Errinorne Isle had become abandoned. This page was last modified on 8 January 2019, at 16:22.